Rolex is not a brand that frequently adds new collections to their catalog. Rather, the company tends to focus on offering new versions of their already well-established watches. So when Rolex does unveil an entirely new watch, everyone takes note. In 2012, the Rolex Sky-Dweller flew onto the scene and it was markedly different from anything the brand had offered before. Positioned as a globe trotter’s watch, the Sky-Dweller is nothing like Rolex’s other dual time zone timepiece — the GMT-Master. Certainly more dress watch than tool watch, the Rolex Sky-Dweller is not meant to be for many, but rather, for a very select few only. 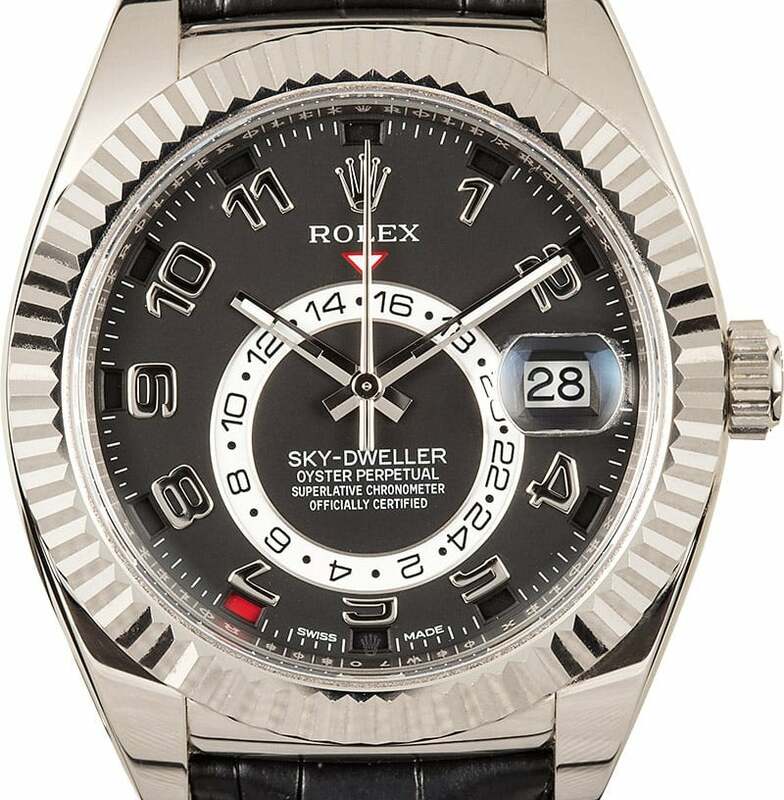 The most ambitious Rolex watch to date, the Sky-Dweller boasts a host of features – or complications in watch-speak. 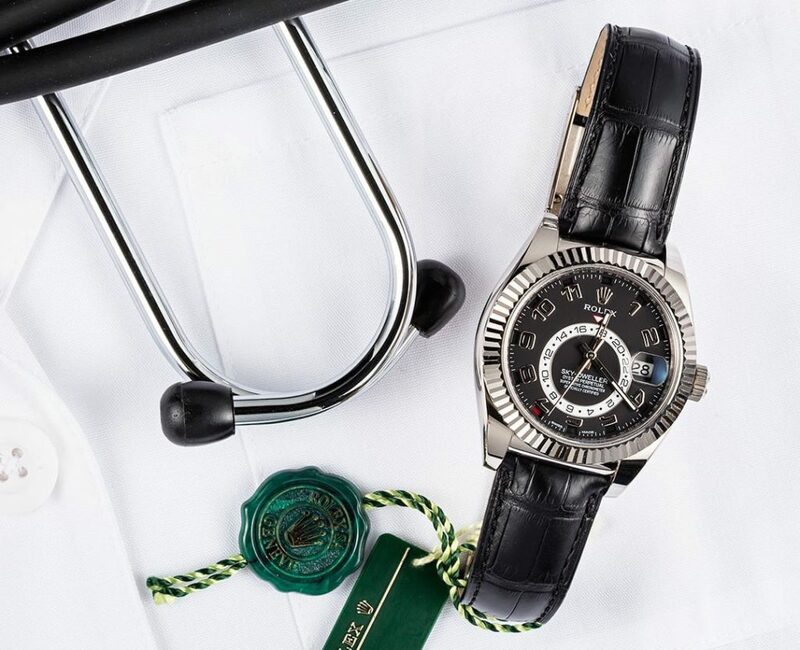 Powered by the proprietary Rolex Caliber 9001 movement, the Sky-Dweller has the trio of center hands, the 24-hour disc display, the date window at 3 o’clock, and the month indicator displayed via boxes on the perimeter of the dial. What’s more, rotating the fluted bezel controls the automatic movement within — hence its name, the Ring Command Bezel. Turning the bezel selects the function — home time, local time, day, or month — to be set, while turning the winding crown makes the adjustments. A complex watch caliber that is easy to use. The COSC-certified Caliber 9001 offers a power reserve of 72 hours. So even if you left your Sky-Dweller in your watch box all weekend long, come Monday morning, it’ll still be keeping precise time. 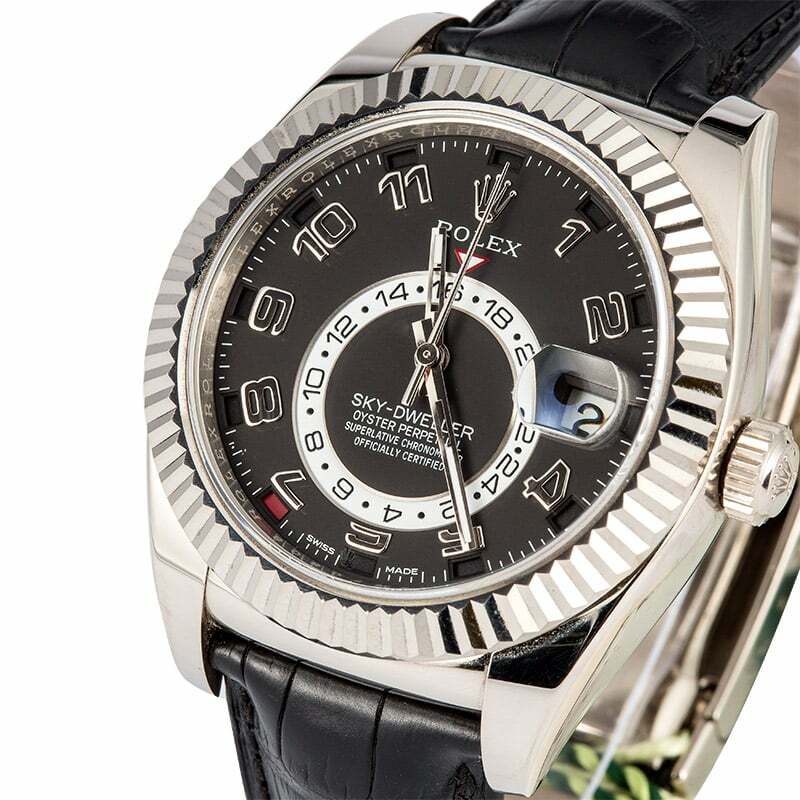 In addition to one of the most complicated Rolex watches, the Sky-Dweller is also one of the priciest. Exclusively crafted in 18k gold, the three metal choices are white, Everose pink, or yellow gold. Other options also include metal bracelets or leather straps, and differing dial colors. This particular Sky-Dweller ref. 326139 is one of the best-looking ones among the collection. With its 44mm 18k white gold case and white fluted bezel presented on a black leather strap, the ref. 326139 is undoubtedly the most understated within a family of elaborate timepieces. The black dial with white gold Arabic numerals works flawlessly with the case and strap, while the red inverted triangle above the 24-hour disc and the red month indicator gives a nice flash of color. For the final touch, the black leather strap of the ref. 326139 sports a matching 18k white gold folding Oysterclasp. The Twinlock screw-down winding crown ensures water resistance to 330 feet (100 meters), while the Paraflex shock absorbers and Parachrom hairspring amp up the robustness of the watch caliber. From the watch brand who’s made a name for itself as the manufacture of status symbol watches, the latest generation of statement watches from Rolex does not disappoint.